The last week has seen the deaths of three sports trailblazers who in different ways brought us all closer together. The awful cliché that tragedy occurs in threes became prophecy over the last week in the world of sports. A trio of towering athletes died, two from age and one decades before his time. These three shared something powerful in common, beyond their field of work. None were ever formally recognized as Hall of Famers for their play, yet all were truly iconic. They were the kinds of players that young sportswriters made pilgrimages to interview; the kind who could either silence a room or cause attendees to spontaneously rise to their feet. They also shared a deeper sociopolitical significance worth remembrance and appreciation. Their names were Earl Lloyd, Orestes “Minnie” Minoso and Anthony Mason. In 1950, Earl Lloyd became the first black player to take the court in the National Basketball Association, making his debut three and a half years after Jackie Robinson broke the color line in Major League Baseball. Lloyd played nine seasons with a reputation as a gritty and tireless defender. He endured segregated accommodations and racial barbs from fans, but was undeterred, blazing a trail for a new generation of players that would reshape, reform and recreate the beautiful game. From Bill Russell to LeBron James, the black athlete in the NBA begins with the slings and arrows suffered by Earl Lloyd. As kind a person as I have met in sports, Lloyd was quoted in his New York Times obituary from 1992 saying, “…they’d yell stuff like, ‘Go back to Africa,’ My philosophy was: If they weren’t calling you names, you weren’t doing nothing. If they’re calling you names, you were hurting them.” Lloyd always took the time to speak about his experiences with a combination of detail and deep humility. His passing at the age of 86 is a tragedy for anyone in basketball who never had the chance to keep his company, even for a cup of coffee. 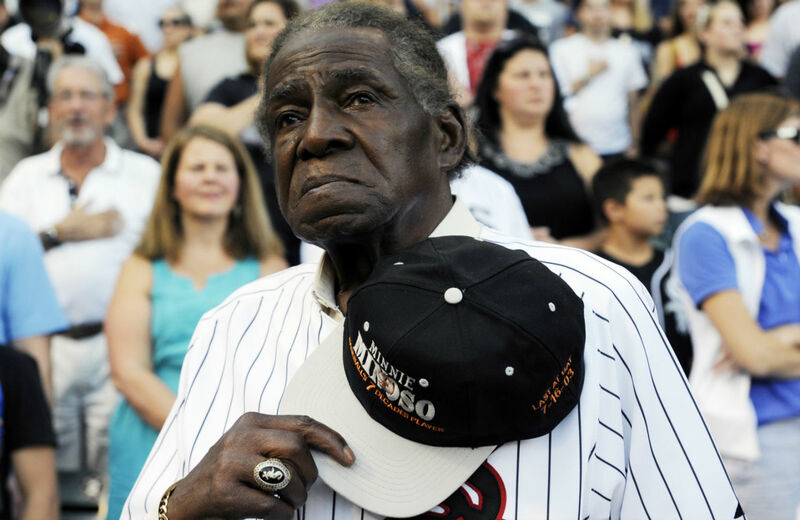 The Cuban-born Orestes “Minnie” Minoso was another trailblazer, becoming the first black player to ever suit up for a baseball team in the city of Chicago on May 1, 1951. He is perhaps best remembered for playing in five different decades, pinch-hitting in 1980 for the White Sox at the age of 55. But that gives short shrift to a brilliant Hall of Fame–quality playing career as one of the best hitting outfielders of his generation and pioneer of racial integration. As Adrian Burgos argues brilliantly at Sporting News, his rightful place is in the halls of Cooperstown. Beyond statistics, he should be honored for his role as a beacon, inspiring the great wave of Afro-Caribbean talent that first flowered throughout Major League Baseball in the 1950s and 1960s. As Hall of Famer Orlando Cepeda said to Ed Sherman of the Chicago Tribune, “Orestes Minoso was the Jackie Robinson for all Latinos; the first star who opened doors for all Latin American players. He was everybody’s hero. I wanted to be Minoso. [Roberto] Clemente wanted to be Minoso.” In a region that has nurtured more baseball talent per capita than anywhere on earth, Minoso broke down the cruelest and most backward of barriers: the one that for decades separated teammates and countrymen from making a joint jump to the Majors because of the different shades of their skin. No one is quite sure how old Minoso was upon his death. Maybe 90. Maybe 92. He always kept that number close to his vest. From Chicago to the Caribbean he will remain immortal. Then there is Anthony Mason, the barrel-chested NBA point-forward who died from complications from a massive heart attack at age 48. He had a rap sheet and flaws that he wore with a shrug. But by torrents of accounts, he also had a beautiful and giving spirit, provoking people to be overwhelmed with grief upon hearing of his death. The outpouring of affection for “Mase” over the weekend must have been stunning to casual observers, his name trending at the top of Twitter ahead of llamas, dresses, CPAC and other frivolities. This is because an entire generation of established NBA writers became fans in the 1990s and for them Mason was a symbol of their dizzy, irrational young-love. That’s because the 1990s NBA was largely polarized around what you felt about Michael Jordan’s air-borne dynasty in Chicago. If you were not a Jordan guy, you were probably by necessity fiercely attracted to their antithesis, a New York Knicks team that played basketball like it was roller derby played on skates with square-shaped wheels. Those Knicks were built around center Patrick Ewing and head-butting shooting guard John Starks. But Anthony Mason was their personification: built like a bouncer with the handle of a guard, and sweet hair-stylings all his own. He was also, like Earl Lloyd and “Minnie” Minoso, his own kind of trailblazer. Mase was the kind of player who’d show up at neighborhood courts, appear in Diamond D videos, and get shout-outs by the Beastie Boys on the album Ill Communications with the line, “I get my hair cut correct like Anthony Mason / Then I ride the IRT right up to Penn Station.” He also makes an appearance smacking down a shot in the Beasties “Root Down video. If the Beastie Boys were a special kind of NYC cool that didn’t transcend race so much as build bridges to connect people across that great divide, then so was Anthony Mason and the city-wide love he inspired. This is why more than the timing of their deaths binds Earl Lloyd, Minnie Minoso and Anthony Mason. They are all people who reached outside their respective communities while never forgetting the soil that nurtured them. With a combination of a wink and a serious eye, they extended a hand to invite those around them to experience their culture, skill and spirit. Whether it was the segregated United States, the disrespected Caribbean or the demonized NYC Giuliani-era inner city, Earl Lloyd, Minnie Minoso and Anthony Mason broke through and then allowed those of us on the outside to see what we have been missing. Rest in peace. Rest in power. And thank you.